The Peafowl is rather large, with the males reaching 90-130 cm in length, while the females are 86-100 cm long. 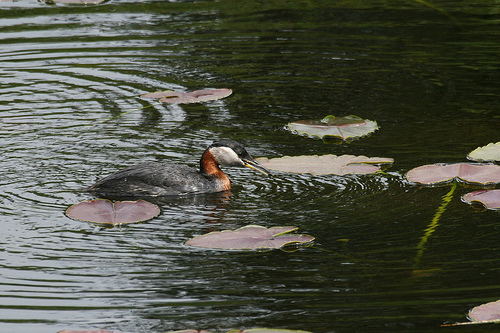 Both the sexes are quite different in appearance – the females have a green neck, while the rest of the plumage is a mix of white and brown. 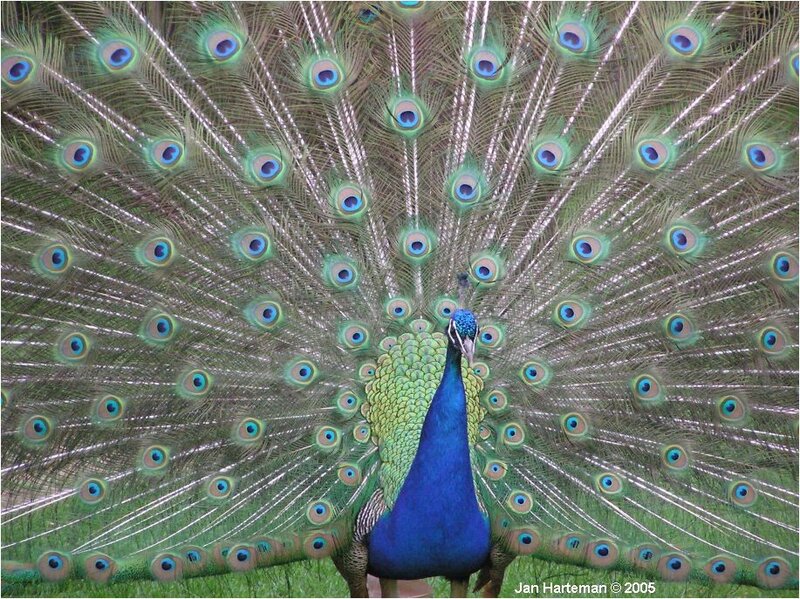 Males, however, are spectacularly bright, with an olive neck, blue chest, light green back and an incredibly large tail that reach a length of 140-160 cm, which can be opened as a fan, if the male wants to attract female’s attention, or sometimes for no reason at all. Indian Peafowls live in small groups made of 1 male and 3-5 females in hilly territories covered with forests. They spend their day on the ground, hiding in thick bushes. In the evening they hide in the trees where they spend their night. 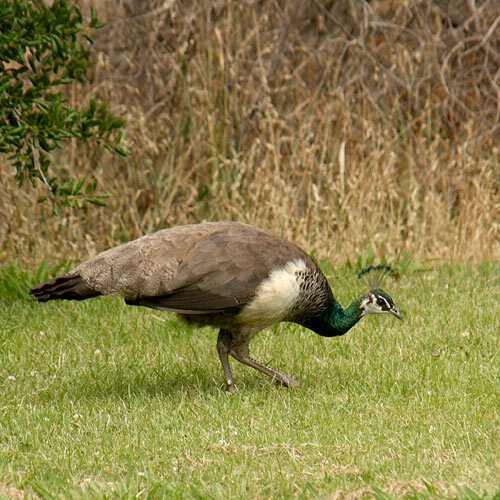 The Peafowl is a very social bird and people enjoy having it near their houses. The life rhythm of the bird is rather regular – they spend the night at the same tree, and also feed at the same place. The group of birds also warn each other of danger, most often predators like the tiger or leopard trying to hunt them. Early in the morning, the Peafowls leave their sleeping place and go to their feeding place. Their diet consists of crop, sprouts, fruit and bugs, and sometimes even snakes. After feeding for a few hours, the group goes to the nearest freshwater source to drink. At dusk, the birds drink again, and then head back to their “home tree” where they spend the night. Unlike other birds that display a beautiful rut dance during the mating period to interest the female, the Peafowl male merely shows off his tail. The ritual itself isn’t very long and the copulation soon follows. The females lay eggs in a shallow hole in the ground. After about 28 days, the chicks hatch. The mother gathers up small leftovers and puts them in front of the young, so they can pick it up themselves. In many regions, the Indian Peafowl is considered sacred and in some villages it’s not unusual to see a Peafowl walking and even nesting freely. 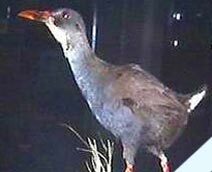 The spectacular appearance, adaptability to any circumstances and easy breeding were all major factors for the bird becoming so popular all around the world. With the bird being so welcome in all parts of the world and holding strong populations both in the wild and in zoos, the Indian Peafowls are not endangered.